their heads in a whirl. And this week’s theme is…..Yellow! 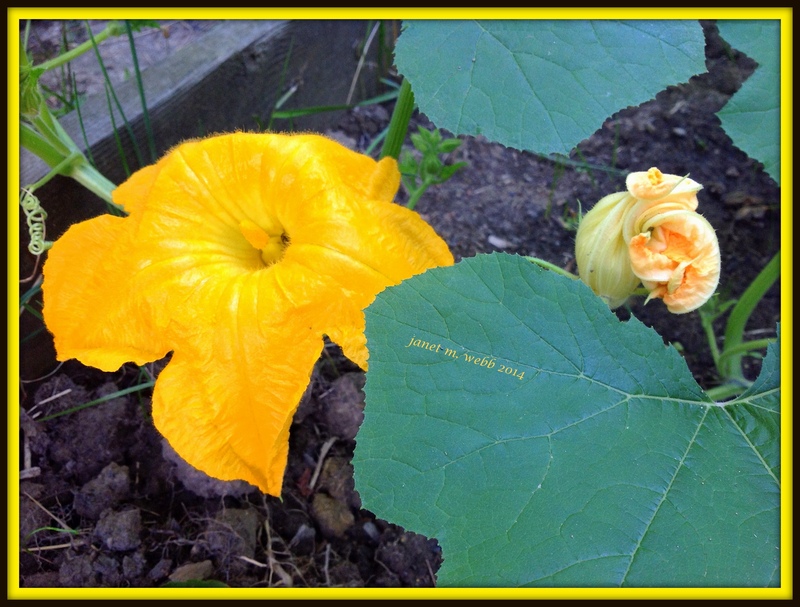 This yellow is from one of the beautiful blossoms I got when trying to grow, as I recall, squash. Alas, the beauty was all I got, as eventually everything withered and died. It was, however, glorious while it lasted! Maybe you will succeed next year….. glorious yellow, though. Where we live now, there’s no room for something as large as this, but we do have lots of daffodils! Reminds me of that lovely poem ‘Twas the night before Christmas’, I used to have it in a pop up book as a child, it was beautiful. Did you take inspiration from it? You’re spot on, Laura. That’s what I did. Glad you enjoyed it. Beautiful flower, reminds me of Hypericum. See the grid is working. Yay! Sandra, if your pingback is finally working, then it was worth all the hassle of last week! A very clever poem, Janet, and squash is definitely one of those veggies that goes from rugged good health to collapse seemingly overnight in the garden. Such a cute poem, Janet. And so true! 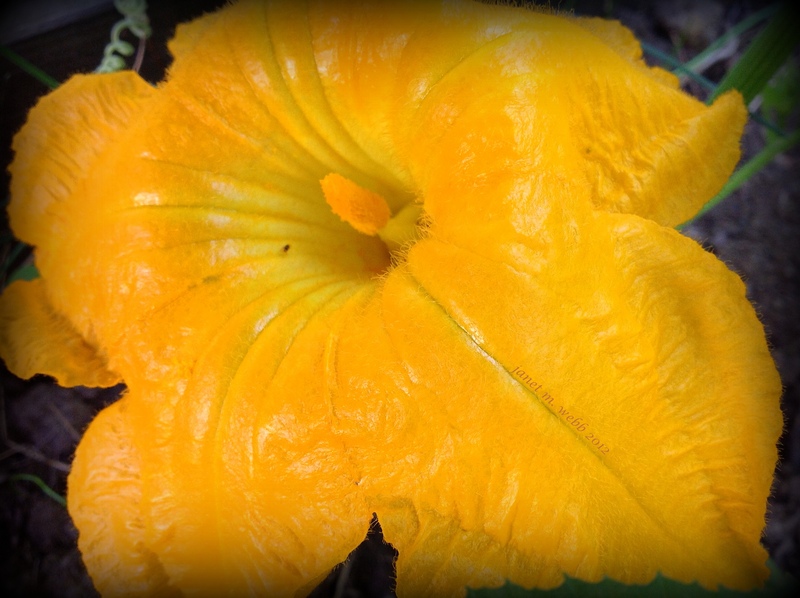 Have you ever eaten a squash flower? They are delicious. We stuff them with cream cheese. I can visualize hundreds of us, just waiting by our computers to see what the challenge is. Funny thought. Thanks so much, Sue. It was something fun to do while waiting for the theme to pop up. Thanks very much! Hope you have a wonderful Christmas. Thanks, Jaap, and merry Christmas. A happy Friday to you, Raewyn, and thanks very much. Food for both body and soul, Judy, the very best kind. It gets easier to see how special those photos are on a cold, dreary, day like to today. Yellow is such a happy color, Charlie, and our day’s been gloomy as well. So yellow was a much-appreciated theme. I hope they cheered your day. the yellow heralding of bigger and better yellow. Love the poem, Janet. “Yellow” seemed like an unusual theme for this time of the year, but it does brighten things up. Merry Christmas! Thanks, Chuck. I thought it was unusual, too, but as you said, it brightens things up. Have a blessed Christmas. Thanks! I’m pleased you liked the post. Thanks, Robin. I enjoyed doing both. and also – my sister’s mother n law makes the best little cakettes with these blooms – they are dense and tasty. She also has other edibles for the squash and zucchini blooms, but I have not cooked with them yet. Sounds delicious! I’ve seen the blossoms for sale at the farmer’s market but haven’t even bought any. Our younger daughter made some stuffed when she was in France a few years ago. Glad you like the poem and have a great weekend. Thanks and I appreciate you stopping by. Enjoy the weekend. I don’t think anything could be more yellow than yours! It was an amazing specimen and worth having, despite nothing to eat at the end of it. 😉 It fed my soul with its beauty. The best part of squash is the flower and so delicious. Great choice, Janet. Squash, is that a pumpkin, Janet? What an enormous flower, and yellow it is! And you wrote a fun introduction to this week’s theme. Squashes and pumpkins are related, Marion. And thanks for the lovely poem. However you pronounce “family”, ours will be here and we’ll have a wonderful time. yellow…squashed. it’s a nice play on words. clever title, and cheerful clicks. merry Christmas to you and yours as well! Thanks so much. A bit of brightness is always good this time of year. Very cute poem and those blossoms look huge! Glad you enjoyed the poem and the photos. The blossoms were very large and very beautiful. Thanks for the visit. I agree about the beauty, Tina. It was such a joy to watch the vine grow and the blossoms…well, blossom! Glad you enjoyed the poem as well. I take it you had a safe trip. Enjoy!